Is Anyone Surprised When a Captive Killer Whale Goes…Killer? Photo: A killer whale frolicking, free and happy, near New Zealand. Of course, it’s sad and tragic that a Sea World trainer was killed by a killer whale today in Orlando. But, please. What do you expect when you force a highly intelligent, social and migratory animal to live in a cramped enclosure? What’s shocking here is not what happened today, but that it doesn’t happen all the time. FREE WILLY: DON’T SUPPORT SEA WORLD. El Blog de Joy is about to hit a little landmark (that is significant only to Joy). 300,000 page views! Thanks to all of you — welcome and unwelcome — who made it happen. I have no aspirations to increase my traffic, as this is my personal blog, but it’s still nice to know so many of you care. I grew up in Corpus Christi, Texas, one of the most humid climates on the planet. I love love love LOVE LOVE LOVE LOVE humidity. 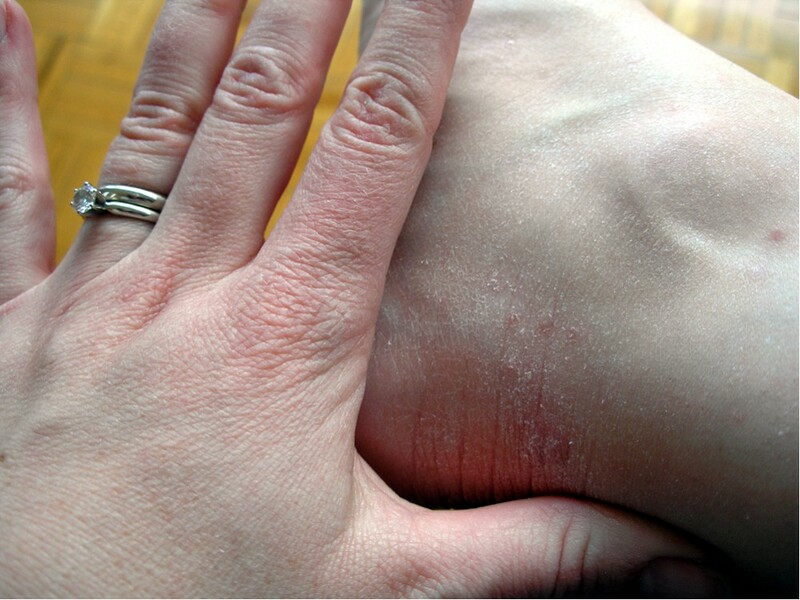 Because without it (Mexico City’s humidity hovers below 10% most days), I start to shrivel. When I went to college in New Mexico, I was miserable. My body just has no idea what to do without humidity, and starts to disintegrate. And now, I’m miserable. And in pain. I normally have model-like hands (seriously, I get stopped on the street and told I should be a hand model. Never a fashion model, though...) and my poor ankle looks like it belongs to an albino elephant. 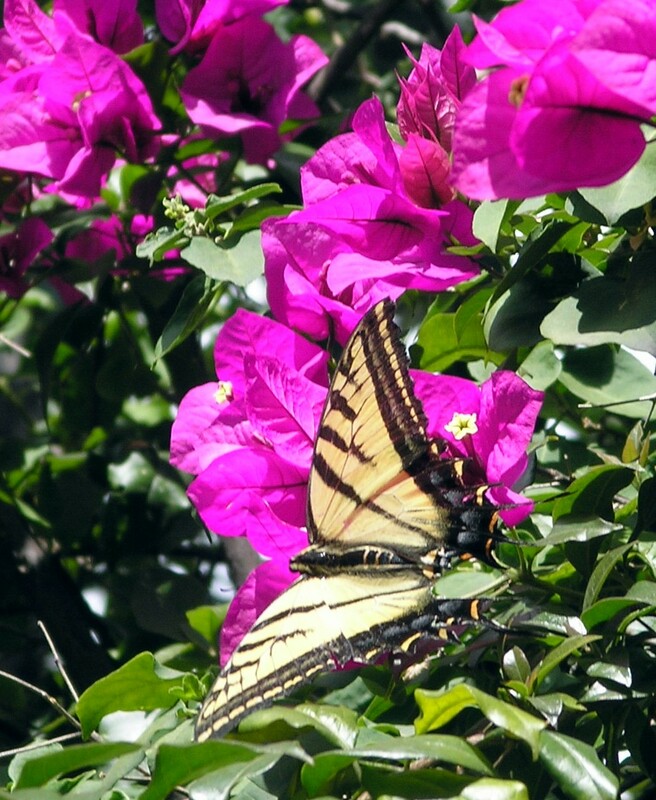 Just a Mexican butterfly to help erase that skin image from your brain. – I think it’s really cute that my parents like David Gray so much. -Damn, I’m gonna miss the little lizards that run across the path. And the gonzo-insanely huge banana flowers. And do those blossoms ever stop growing? -That guy with the labrador looks like Dora’s boyfriend. -WHY DO I ALWAYS GET BLISTERS???!?! -I bet I’m getting my “exercise red face” right now and looking especially white. -Do people think my “La Sirena Gorda” t-shirt is funny? Or apt? -I love how there’s always just as many male parents as female parents in the playground. at 5 p.m.! -I’m so glad the Argentinian bakery doesn’t bake stuff in the afternoon. -Would it be funny or tragic if the old man juggling bowling pins in the middle of Avenida Sonora aimed poorly and pinged me in the head while I was crossing the street? 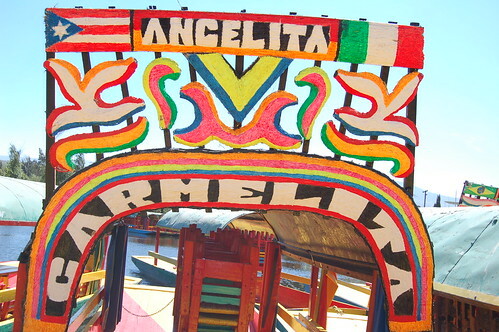 Five weeks from today, I’ll be on a plane, moving back to New York City after nearly 29 months in Mexico City. Where to go next wasn’t an easy decision for us, and we’re still debating how we’ll live in NYC — buying a row house in the city, or maybe a country home out in the Catskills, or maybe not buy any real estate at all (meaning we’d rent until we made our mind up)? Quien sabe. – and most of all, the beaches. 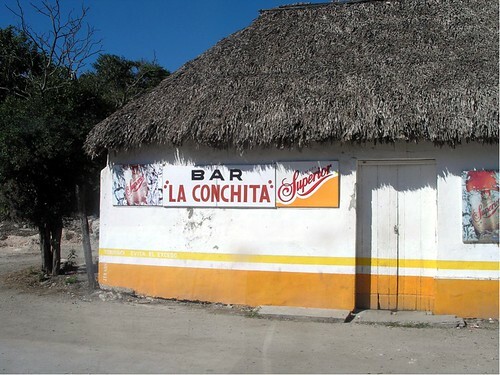 Good god, Mexico, tus playas son increible, no?!!! – the frequent power outages and surges. My poor, poor computer has already had its motherboard replaced, and I am not sure if it can handle another shock to the system. – bakeries and coffee shops that don’t open until 9 a.m.
– uber-wealthy Mexicans eating down the street from my apartment, while their bodyguards with large guns stand in front of my apartment. A crude approximation of all the places I've been, so far, in Mexico, shaded with pinky-purple. I’ve now visited 23 of the 31 states of Mexico (have yet to visit the two Baja states, Sinaloa, Sonora, San Luis Potosi, Hidalgo, Aguascalientes nor Durango). This means I’ve been to most regions of Mexico, except the Baja peninsula. 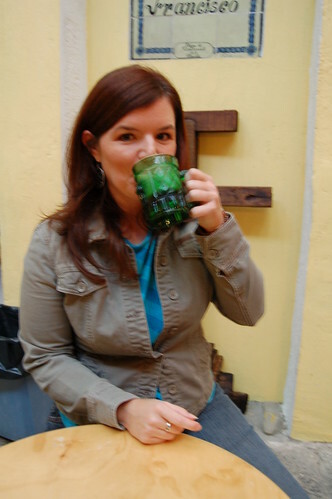 After all that traveling, my favorite is still the Yucatan peninsula, which I first visited in 2004 when we lived in New York City. During that trip, Brendan and I were smart enough to rent a car, avoid Cancun and head south for the still-somewhat-pristine beaches of Tulum. From there, we turned inland and visited some amazing, way off-the-beaten-path Mayan ruins known as the Ruta Pu’uc (southeast of Uxmal). Along the way, we’d stop and swim at the cenotes, freshwater pools formed in limestone. The combination of perfect beaches + road trip to gorgeous limestone ruins + deep freshwater caves you can swim in =’ed my sort of vacation. I longed to return. After our first initial visit, we visited again in 2006 for a short trip to the Sian Ka’an Biosphere, a protected stretch of the Caribbean coastline. We kayaked in the mangroves and snorkeled in the ocean while it snowed in New York City. 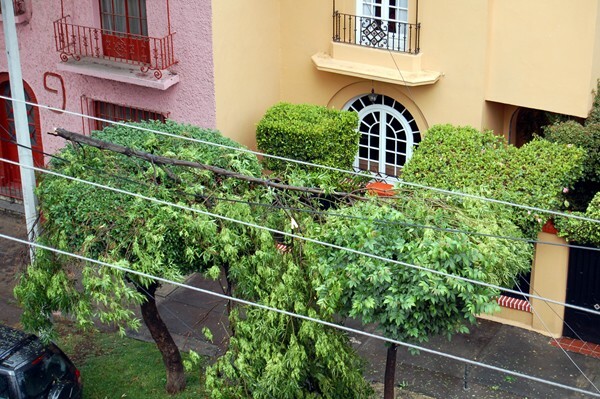 Now that we’re living in Mexico City, the distance is still pretty far — it requires a flight or a 24-hour bus ride. We went back last February to hang out with my sister-in-law and her boyfriend in Tulum for a few days, then in June, I stayed on Isla Mujeres off the coast of Cancun to swim with wild whale sharks — one of the singular most amazing days of my entire life. 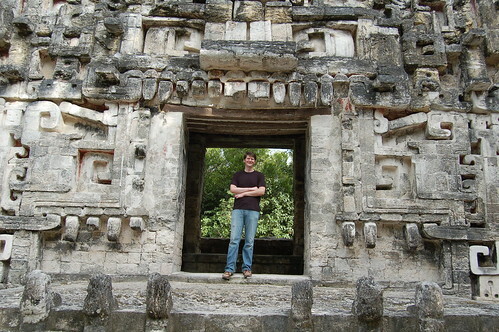 And….finally….a few weeks ago, we went to the lower Western portion of the Yucatan peninsula, where few tourists go. We visited the protected ruins and biosphere of Calakmul, then the city of Campeche, ending the trip with a long drive down the Gulf shore back to the state of Tabasco. The only trip I have left to do in this part of Mexico is the northern perimeter, following Progreso to Merida to Isla Holbox. I’ve been discussing the Isla Holbox idea with whale shark buddy, Sue-Lyn — maybe later this year we’ll go. Back to my point: I can’t get enough of the great beaches, great ruins and great wildlife. Since we returned from this recent vacation, I’ve already blogged about the amazing nature we saw (MONKEYS!) 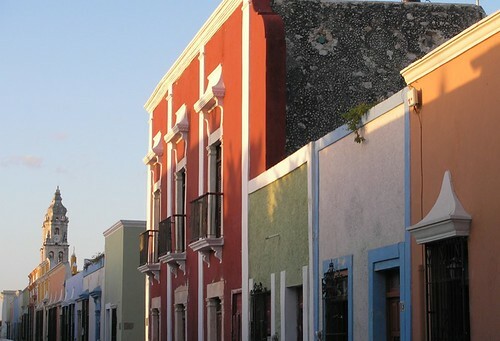 and so now let’s take a look at some of the lesser-known archaeological sites we visited, plus pretty little pastel Campeche. 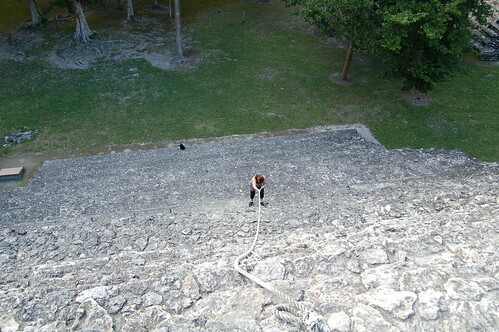 Climbing one of the two pyramids in Becan. 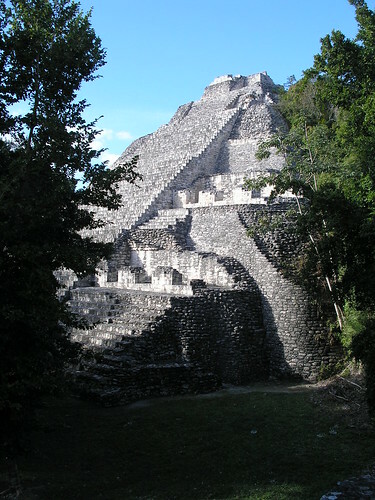 After I finished climbing, this was the view of the other big pyramid at the Mayan site of Becan. 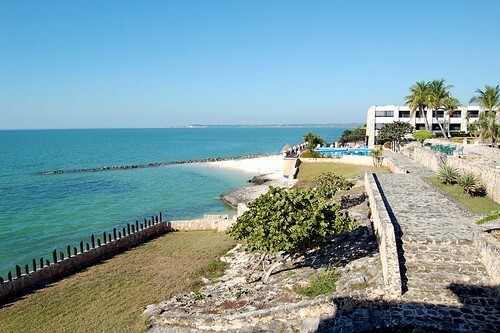 Campeche, Mexico is now my favorite city in Mexico. It's super cute. 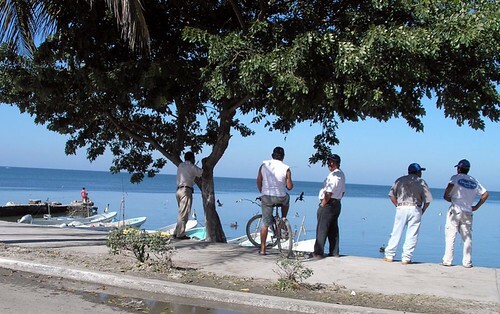 Down the road about 45 minutes from Campeche is the remote hotel of Tucan Sihoplaya. The drive between Xpujil and Campeche takes four hours and is mostly desolate. Except cute buildings like this. 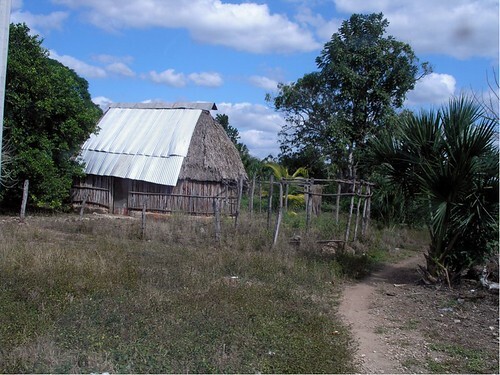 In this part of Mexico, the Mayan people still live like they did hundreds of years ago, for the most part. 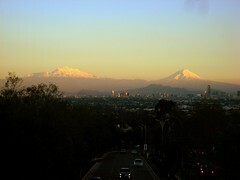 It’s easy to forget they’re there, until one of your Flickr.com buddies posts a great shot of how the twin volcanoes make even monstrous Mexico City look teensy. It’s supposed to be the peak of the dry season here. November through May equal blue skies and dry air — normally. But no, it’s been raining for the past week, on and off, quite heavily at times. I don’t want to know what climactic forces are at hand to turn the weather patterns on top of themselves. As a result, many neighborhoods are flooding (the link is a photo slideshow of the damage), losing electricity and, trees are falling all over the place. Whenever it gets like this, I don’t like to walk outside, because there are so many limbs falling from the sky. The park becomes a tree graveyard (both for trees and potential humans caught beneath them). Right now, while I was working, I heard a loud snap and saw a big rush of green dropping down. The gorgeous tree across from us — which is home to hundreds of birds — just lost a giant branch. It had been looking very droopy these past two days, and the branches above are also leaning over, pointing down. They may go soon, too. 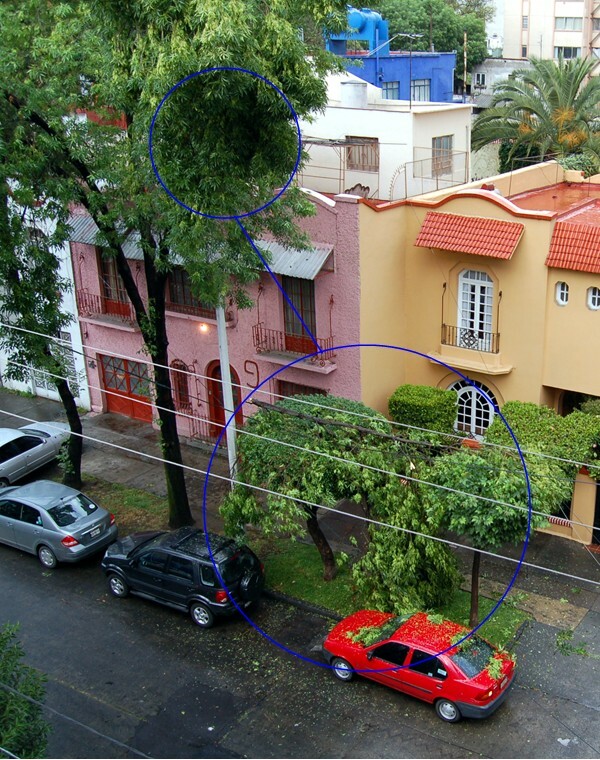 After the snapping sound, I went to the balcony to make sure no one was caught under the branch. Thankfully, it was cushioned by two smaller trees below it, and a driver parked immediately below the tree was OK — no giant branch ramming into his windshield, which would be my big fear. He backed out right after it happened and re-parked. Perfect on a chilly, rainy Mexico City January evening. Note: Use more water if you like your soup soupy, less if you like a more hearty stew. Will feed 6. Makes excellent leftovers. Soup: In large soup pot, saute onions in 3 tablespoons or so olive oil until almost clear. Add garlic, stir and cook for a minute more. Dump entire contents of tomato can (plus chopped tomatoes) into soup pot. Add chicken, bay leaves, achiote, salt/pepper. Add about 1 cup of water. Stir well, and bring to simmer. 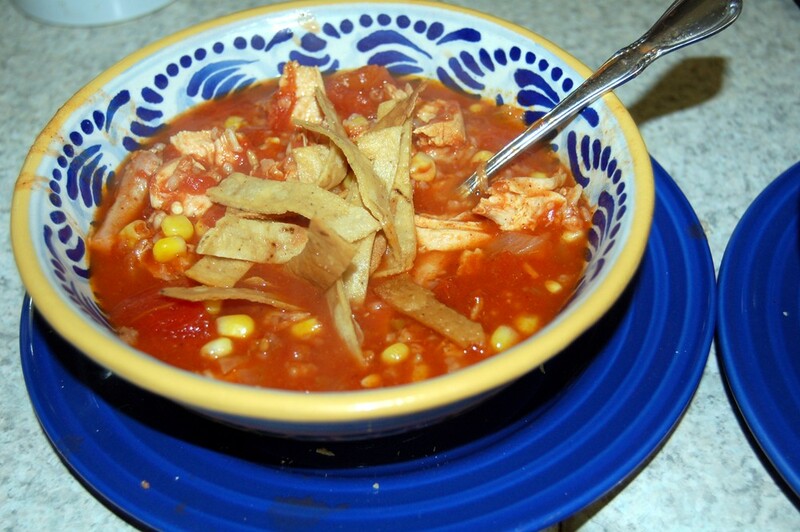 Once simmering, stir well, then add corn, rice and beer, and salsa, if desired. Cook at least 5 minutes, longer if you want everything more tender. Stir occasionally and taste frequently, tweaking to desired flavor. Tortillas: Cut in half, then cut into thin strips. In small saucepan, add enough veggie oil to cover tortilla strips. Heat to medium heat. Add strips, fry for 2 minutes on one side, then flip. When golden brown, remove and salt the strips. Keep hot. Serve on top of soup. 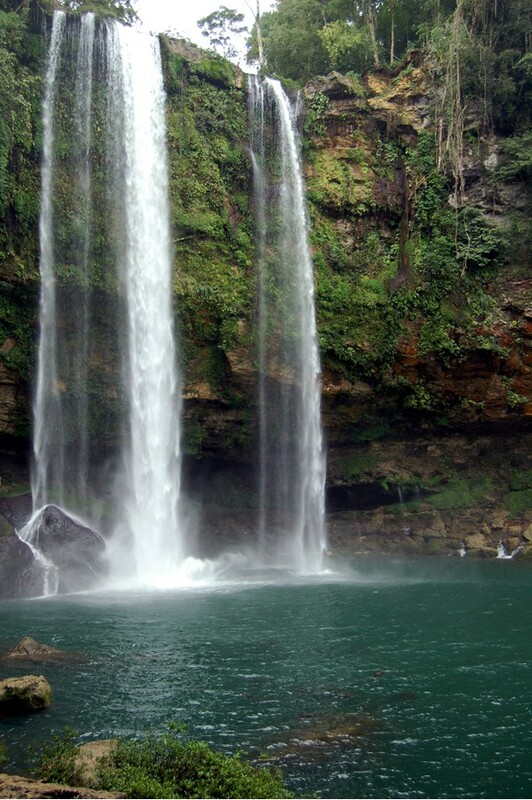 On our recent vacation, after visiting the awe-inspiring ancient Mayan ruins of Palenque, we decided to drive over to Misol-Ha, a set of waterfalls about 20 minutes up the mountains in the Mexican state of Chiapas. It’s a gorgeous drive, the world doesn’t get any more greener and lush. While the entrances to Palenque are crawling with annoying vendors schlocking useless souvenirs, I guess the distance required to get to Misol-Ha keeps vendors away. There were none in the parking lot — the first good sign. Then we walked by a set of adorable cabins, set deep in the jungle. Second good sign. I experienced some sort of weird body high at Misol-Ha. I struggle to explain it, except I felt incredibly happy, to the point that I was almost hyperventilating. I wanted to stay here, and I was immediately sorry that we hadn’t made reservations at the cabins next to the waterfall. I’d love to come back here, one day, hopefully soon. Especially because we hadn’t brought our bathing suits, and swimming is permitted here. IT DOESN’T GET MORE BEAUTIFUL. 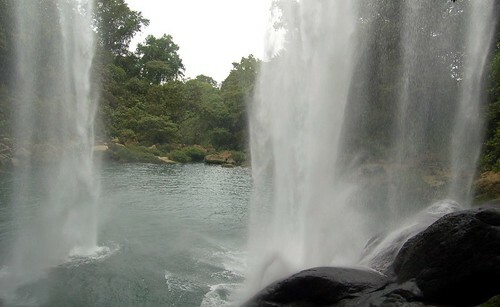 As if this view isn’t splendid enough, visitors are allowed to walk behind the waterfalls. 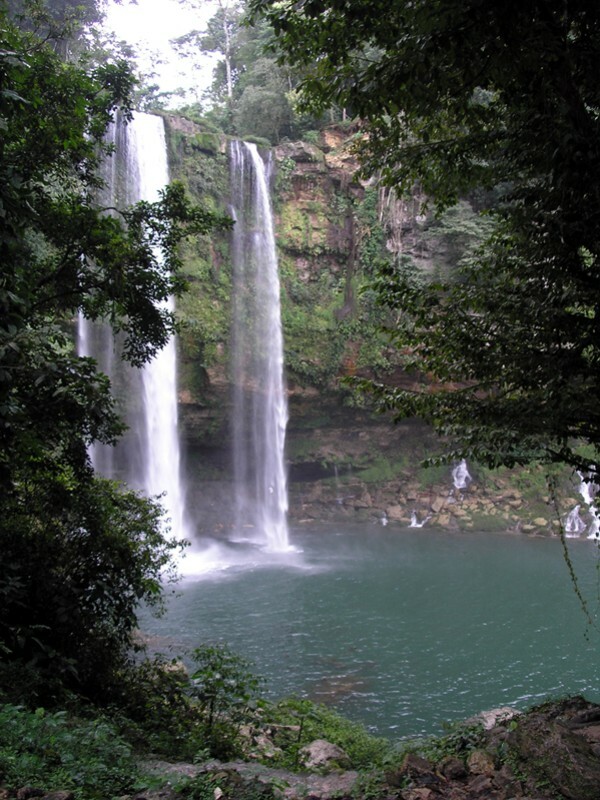 My little happy-high got ever higher when I was behind Misol-Ha, listening to the roar of the waterfall smash against the rocks, sending a mist over my body. They filmed the movie "Predator" here -- true story -- but I didn't feel the least bit threatened. It was bliss. Apparently the water flow can really vary depending on the season — we happened to catch it at a peak time, right after a long week of rains. After checking out other videos posted by travelers, I realize we caught it at its most beautiful point — not too dry (the waterfall dries up to one trickle, and the pool below turns brown) and not too overflowing (the waterfalls overwhelm the pool, making it hazardous to be near).